Individual leaves are ready to pick 6–7 weeks after germination. Picking outer leaves regularly will keep the plant producing until it starts to flower. Younger plants have milder tasting leaves. 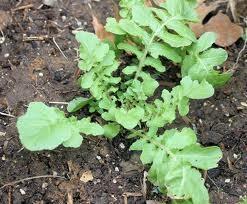 If you prefer the milder leaves, seed new plants every couple of weeks to maintain a continuous supply of young plants. Plants prefer cool temperatures, so will perform best when planted in early spring or late fall. Withstands light frosts. Will resow if allowed to go to seed. Arugula Italian, OP Delicious salad greens with deep, spicy flavor. Will resow if allowed to go to seed. Flowers are edible too. 8–10" tall. Plant 3–6" apart.